Victoria's life is forked one night when social services shows up to her door, the door to the house she's been locked out of by her widowed and remarried father. She's told to pack some belongings--nothing valuable--and get in a social worker's car, and with that, she's in the foster care system. After a night on a stinky couch in the social worker's office (or home, I forget), Victoria is delivered to foster-mother Connie's house, where she is to reside in the girls' dormitory with two foster sisters and Connie's real daughter. Yep, it's like that. Victoria is a second semester senior and has to start fresh at a new school, which is hard enough when you're not carrying secrets, shame, and have zero contact with your old life (cell phones are valuable, so verboten). She's hella lucky to be befriended by a sweet girl named Christina, and it's to her credit that she allows herself to be brought into Christina's life because the secrecy and shame make bonding difficult. Things get better, fortunately, and Victoria gets back some of what she's lost, but it's a slog. The story drives home how when you're at a disadvantage, everything is harder and it's impossible not to make mistakes. 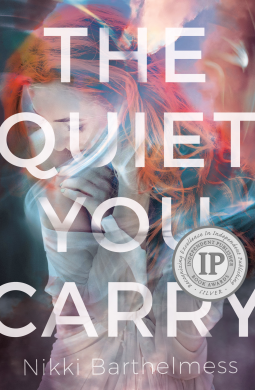 The Quiet You Carry is an important read on a topic that is underrepresented in young adult literature.